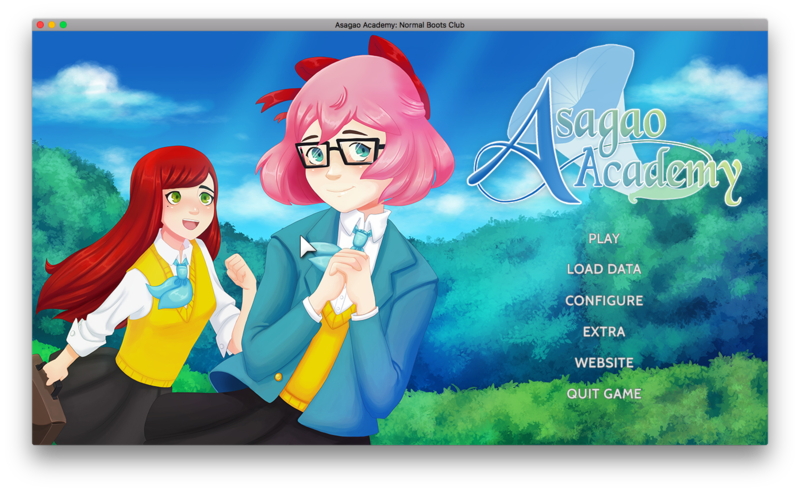 When things in her life get to be too much to handle, Hana Mizuno transfers to Asagao Academy to start fresh. Once there, she runs into the Normal Boots Club - a group of handsome, competitive gamers, and the most popular guys in school. And they need her to compete in this year's gaming tournament! 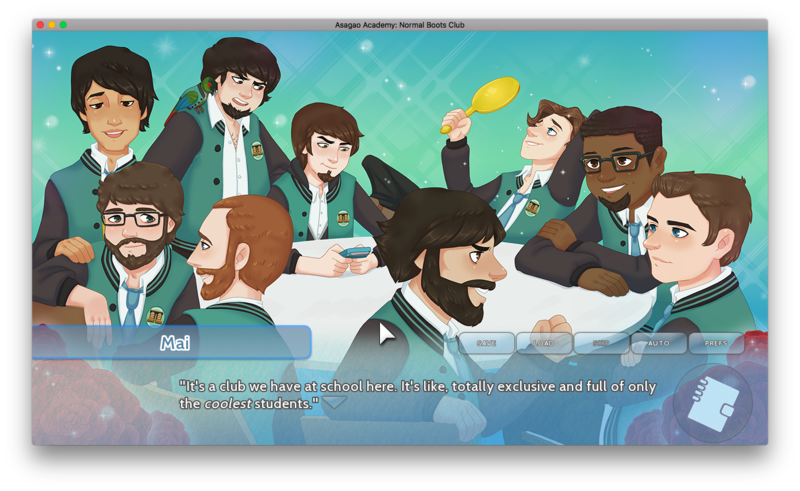 A fan-made otome dating sim and visual novel featuring JonTron, PBG, Continue?, DYKGaming, Satchbag, ProJared, and The Completionist! The story is all about Hana Mizuki, a transfer student at Asagao Academy. 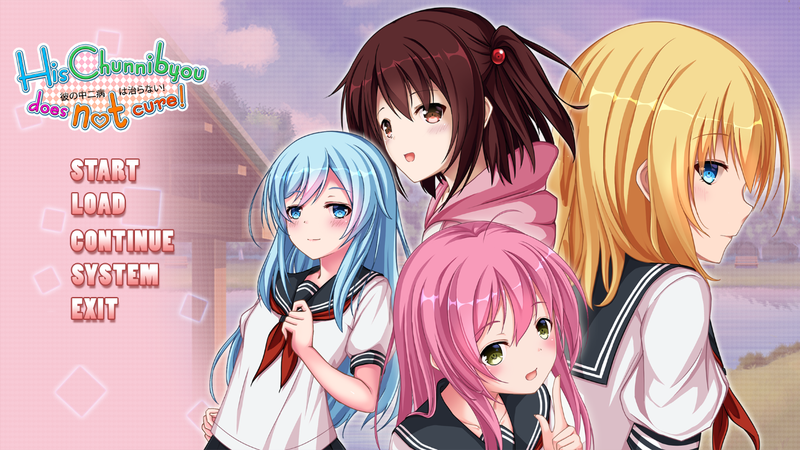 It's actually your typical high school otome, which was really common a few years ago. I liked them then, and I like them still, haha. 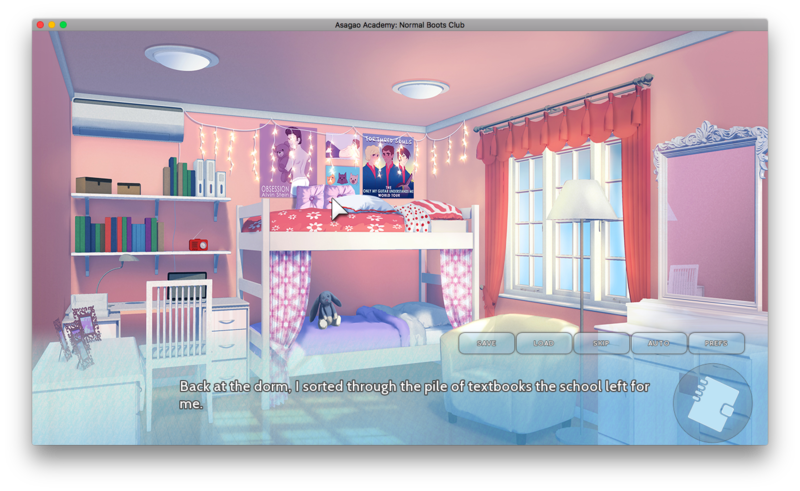 I play high school otome less often now though, since a.) there aren't lots of new ones anymore b.) it's been three years since I graduated from high school... it does feel weird sometimes. 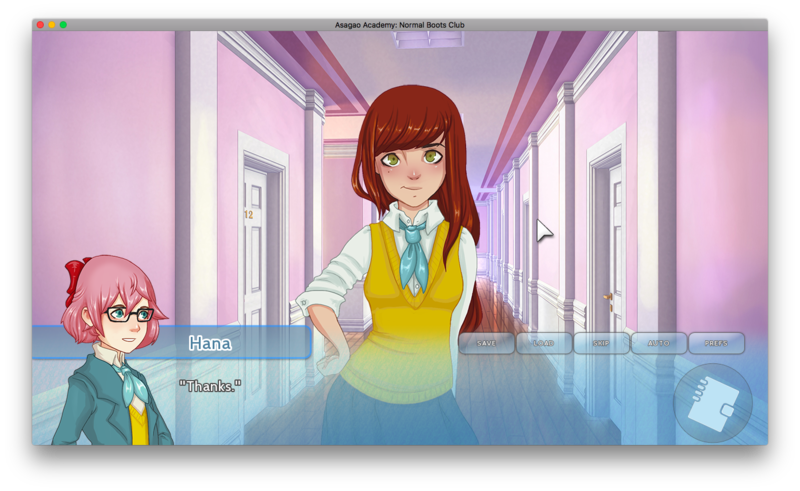 If there are games set in universities though, I still jump at the opportunity. That's how much I love school-based settings. Ooooh, what a cute purple-pink dormitory! Like other high school otome though, all the guys here are just so perfect and so wonderful and so nice and MC just has to fall in love with one of them. Through a gaming competition. Yep, they're all competitive gamers, and MC must join them in one of their tournaments. That's actually pretty cool. What's not cool is how Hana's bullied in this story. I really hate it when people are bullied, be it in real life or fiction. The sad thing about it is that I always used to say that I never saw any bullying back in my elementary or high school years, but now I'm starting to think that perhaps I just never noticed it happening around me. I was never bullied in school, nor did I know anyone who seemed to be bullied. In my eyes, everyone was friends. So I had honestly thought that bullying was just something they came up with to add drama to a TV series, or a book, or something. But now that I'm a lot older... I know that it's real. It's real, and it's so sad that it is. In this game, Hana was being bullied by everyone just because of very superficial things, and it's just... it's just as horrible as it sounds. Like, leave her alone, you judgmental people. Actually, she can dye it, but I don't recommend it. You already rock the way you are, girl! Aside from the bullies though, Hana's got more problems, mostly relating to her past. I was like, "oh no," as I read, because it seemed like I was uncovering so many things. She also got into all sorts of trouble here and there, and that was troublesome. At least it was interesting to see how she dealt with them. That's actually a good thing story-wise, because it made her seem like a much deeper character than she seemed at first glance. 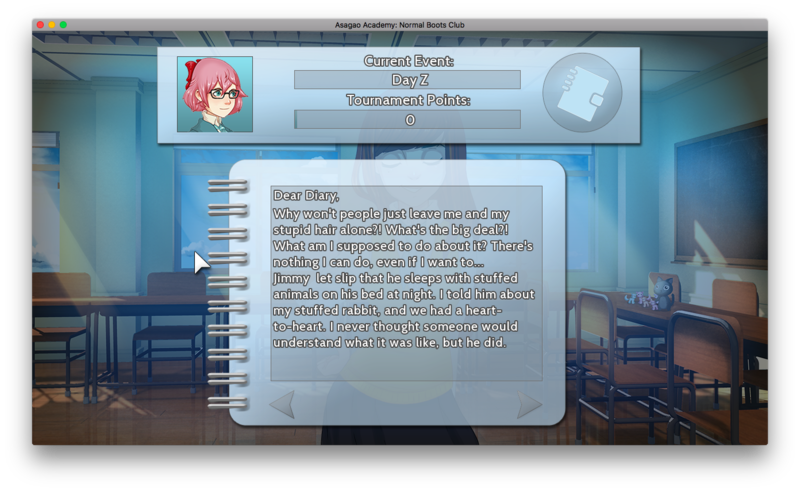 On the upside, Hana has a very nice relationship with her father, and she also gets a few friends along the way in her new journey in Asagao Academy. The writing is very good. It's just the right kind of descriptive, putting us in the position of the MC. The humor is spot-on! I found myself laughing at some of the funnier parts. The dialogue is also nice. I enjoyed the interactions of the characters with each other. Since the main guys are all apparently based on real-life Youtubers, I think that gives them a much greater degree of realism. In fact, I did feel like they weren't just stereotypes, unlike some other visual novels that employ that kind of characterization. Man, I also appreciated how the best friend character, Mai, is not such a passive best friend. At one point, she actually questioned Hana's sudden closeness to the guys. 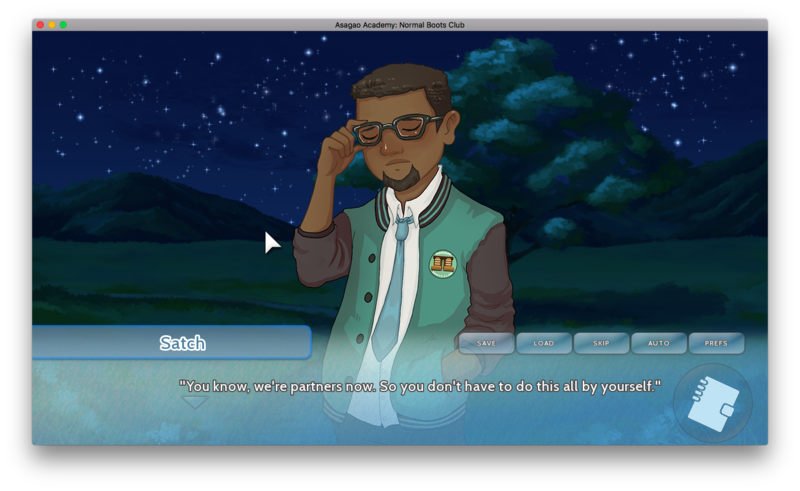 Well, you guys are in an otome game, so... haha. Another thing about her is that... well, she really isn't a traditional best friend. Play the game to find out, hehe. They're so cool, they must be feeling cold already. Look at those varsity jackets. Brrrrrrrr. Anyway, there are so many guys to choose from; it's practically an otome fan's paradise, haha. My favorite is Satch, the cutie bookworm who works at the library. He's really sweet, that guy. I absolutely enjoyed his route. PBG and Shane are also pretty nice, but... hehe, it's Satch for me, all the way. I would definitely go for PBG in my next playthrough, though. There's a decent amount of choices here, but man, with all the guys, I just wasn't sure anymore how to get who. Since I was aiming for Satch though, I ended up rejecting everyone else. Hehe. Apparently, if you keep everyone on their toes, you'll get the option to go out with all of them, but I only had the option to go after three. So, yep, maybe on my next playthroughs I can get the others. Character sprites are unique. I personally like the anime style better, but the style used here is also terrific to look at. Very polished and professional. Also... the sprites blink! Okay, I've been so interested in blinking sprites ever since I learned how to do them for Once Upon a Hallow's Eve, so... hehe, pardon my enthusiasm. Also, the characters have multiple outfits each. Like 2 or 3, maybe? It's a welcome thing, considering this is a free game. How cool is that? HER DORM IS SO CUTE, LIKE WTH? Look at those lights! Looooove. Backgrounds are a hit or miss for me. Some are nice, like the hallway and dorm room backgrounds (hey, you gotta love pink!) but some, like the exterior of the school, look way too simple for me as compared to the others. Generally though, I really liked the soft yet polished look they have. CGs are nice. They have the same art style as the sprites, at least. Hahaha. That poor fish looks terrified, but oh well. There's an opening theme, cool! I like opening themes, and I like this one, which is in Japanese. I did notice however, that the singer seemed to have an accent? The way she pronounced words made it seem like she wasn't Japanese. That was kinda weird for me, to be honest. It's partially voiced, which is also pretty nice. Not every line has a voice, and usually only the expressions have one, which reminds me a lot of the Rune Factory games. The background music is very lovely. I also liked the little effects here and there, such as the purring of the train and the chirping of the birds. It makes everything sound more alive. The tracks are very fitting for the scenes. I especially liked the track when they're playing games. 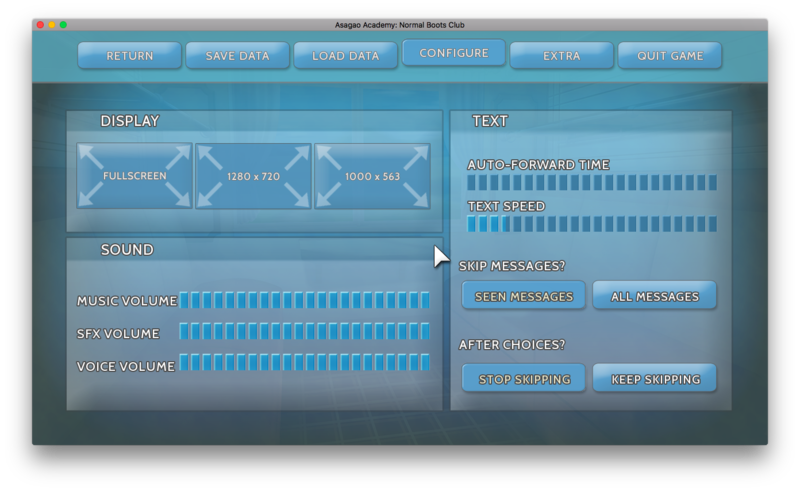 GUI is pretty nice. It's very minimalistic, but it looks good. There's even a custom mouse pointer. I did encounter one major problem though. I can't save. It always comes up with an error whenever I try to save. That's a problem for a game with this length. It was quite long, yet I had to finish one whole playthrough in one sitting because I couldn't save. What a bummer. So... I really enjoyed this game! It's pretty long, which is great if you ask me, considering that this is just a free game. 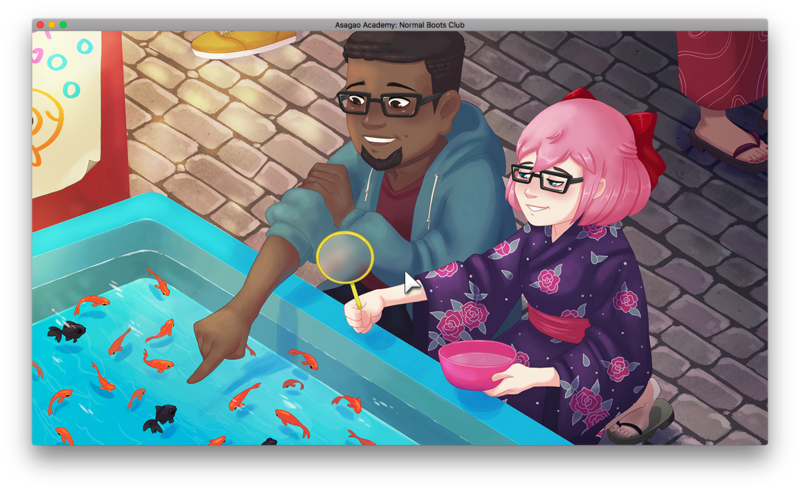 Some people may be put off by the non-traditional art, but I assure you, it gets more and more endearing as you play. The story is nice, the writing is good, the characters are unique, the art is lovely, the music is great! What's not to like? The only problem? You can't save. It's kinda hard to save a whole block of maybe 5 hours just to finish one route, so that's definitely a problem. For that. 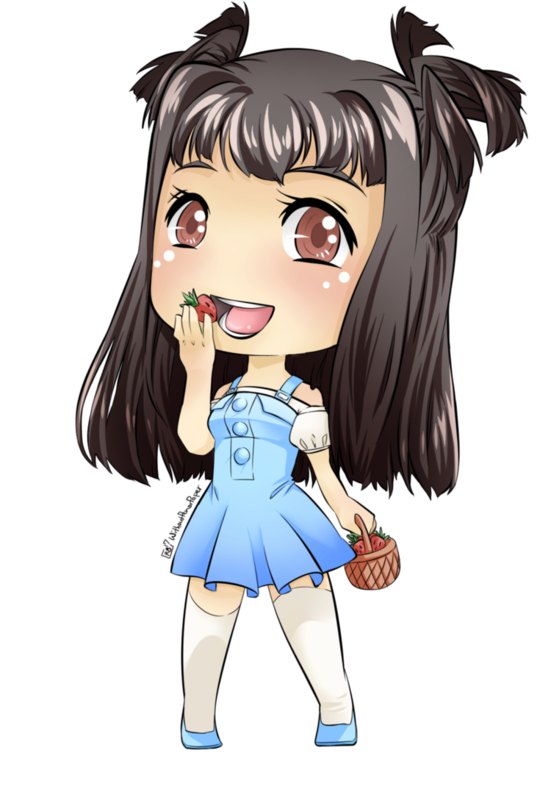 I give this nine strawberries. Saving is a big deal, yo! You can get the game for free here.